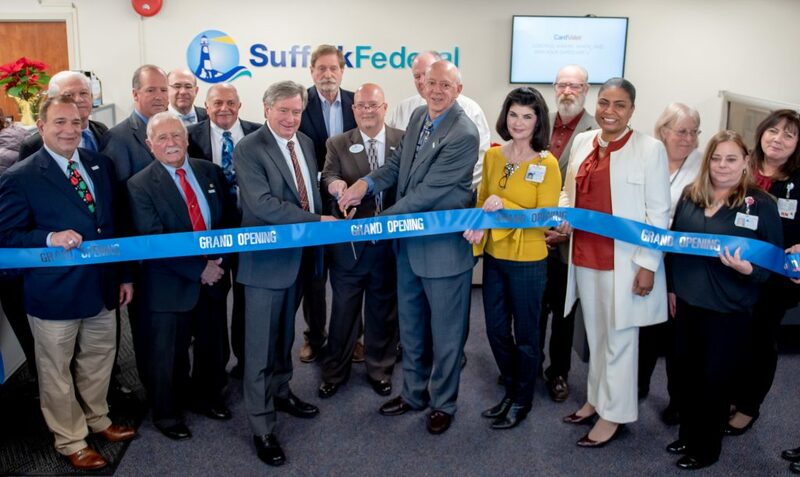 Suffolk Federal opened its 10th branch in Port Jefferson at St. Charles Hospital (200 Belle Terre Road) with an official ribbon cutting ceremony attended by the CEO and Board Members from both Suffolk Federal and St. Charles Hospital as well as several Long Island dignitaries. The opening of the branch follows the merger of Suffolk Federal, one of Suffolk County’s leading credit unions, and Long Island Community Federal Credit Union (LICFCU). The conversion of the LICFCU core system was completed on December 1st . All members of LICFCU are now members of Suffolk Federal, receiving shares in Suffolk Federal in exchange for the shares they owned in LICFCU. The merger was supported by the Board of Directors and membership of both credit unions and approved by the National Credit Union Administration (NCUA). “We welcome our new members to the Suffolk Federal family,” said Ralph D. Spencer, Suffolk Federal President & CEO. “The opening of our Port Jefferson branch reinforces and strengthens our commitment and loyalty to Suffolk County. Our legacy is deeply rooted in the local community and the opening of this new branch is a vital component within our strategic plan as we continue to grow, service and provide real value to residents and businesses in Suffolk County now and in the future,” he continued. Suffolk Federal’s solid independent financial position with assets in excess of $1 billion, 60,000 members and now 10 branches in Suffolk County will provide enhanced services, stronger banking options and new opportunities to all Suffolk Federal members. “We are excited that Suffolk Federal has become part of the St. Charles Hospital community and look forward to the immediate and long-term benefits,” said James O’Connor, President, St. Charles Hospital. “This relationship is a wonderful fit for both organizations and an excellent opportunity to provide enhanced benefits with greater financial access and services within the hospital community and beyond,” he added. Convenience and Exceptional Service: Suffolk Federal currently has ten conveniently located branches including its headquarters in Medford, as well as Commack, Eastport, Islandia, Miller Place, Riverhead, Sayville, Southampton, West Babylon and now Port Jefferson. All members are also offered thousands of Shared Branching locations! Access to financial planning, insurance and investment services; First Time Home Buyers Programs; Free financial literacy education and counseling. The Port Jefferson branch is now open to the public in addition to employees of St. Charles Hospital and is offering an opportunity to “Ring in the Holiday Season” with a special gift for new members of the branch. When new members sign up for a FREE Checking Account with Direct Deposit between December 3rd and December 31st, they will receive a $200 deposit gift from Suffolk Federal. For more information, please phone 631-924-8000. Pictured (center from left to right) are James O’Connor, President, St. Charles Hospital; Ralph D. Spencer, Suffolk Federal President & CEO and James J. Maggio, Jr., Suffolk Federal Chairman of the Board; Members of both Suffolk Federal’s and St. Charles Hospital’s Executive Staff; Brookhaven Town Councilwoman Valerie M. Cartright (in white coat on right) and Village of Brookhaven Trustees Bruce Miller and Bruce D’Abramo.